Bring some southern hospitality to your next party (or barbecue) with these soul-inspired recipes with a very special kick. Because cooking is better when you add a little spike. Not quite sweet, not quite savoury, these corny snacks are the perfect ‘in between’ times food. They’re busy with bright kernels and can easily be made gluten free by substituting gluten free flour or chickpea flour. What really makes them shine is the glaze, with its mellow Jack Daniel’s kick. Tote them to a picnic, serve them as part of a Southern feast, or pack one up in Tupperware to make your next desk-bound-lunch a little less blue. These are best served warm, with some butter or relish on the side. 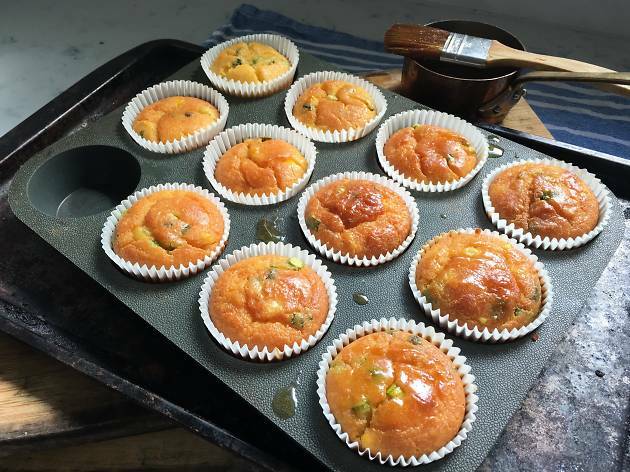 1)Pre heat the oven to 180C and line your muffin trays with cupcake liners. 2) Whisk together the wet ingredients until well combined. 3) Fold in the dry ingredients. 4) Use an ice cream scoop or tablespoon to portion the batter into cupcake liners until ¾ full. Bake for 35 minutes, until the tops are golden and a skewer comes out clean. 5) To make the glaze combine the ingredients in a saucepan and simmer for 2 minutes until reduced and thickened. 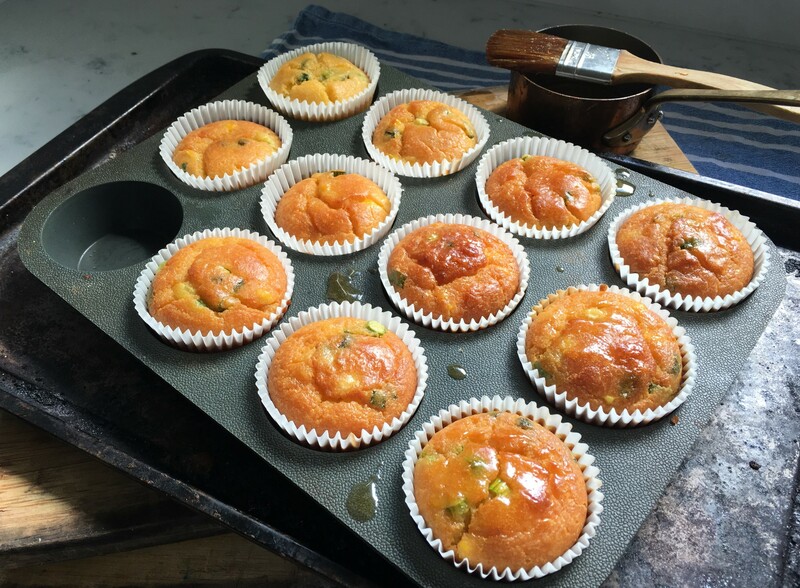 Brush over just- baked muffins while they are still warm. Here’s an easy guide to entertaining. Step 1: Make a large batch of Tennessee Mules. Step 2: Make a bigger batch of pulled pork. Hosting friends en masse doesn’t get much breezier, particularly when you combine the two. The sweet lilting twang of Jack Daniel’s, ginger beer and a cheeky twist of lime found in the classic Tennessee cocktail are the perfect bedfellows for pulled pork. This crowd pleaser will happily potter away in a slow cooker or pressure cooker while you prep the rest of the party - or pour yourself another drink. Try serving this sticky pile of shredded meat on fluffy rolls with hot sauce, over roasted sweet potato halves, or with corn muffins and chow chow relish. Cut the pork into three large chunks. Add the olive oil to a sauté pan and brown the pork well in batches. Transfer the pork and remaining ingredients to either a slow cooker or pressure cooker. Cook for 5 hours on high in the slow cooker, until the pork pulls apart with a fork, or for 1 hour in a pressure cooker. Remove the pork and set aside. Reduce the juices in a saucepan by at least half, until you have a viscous sauce. 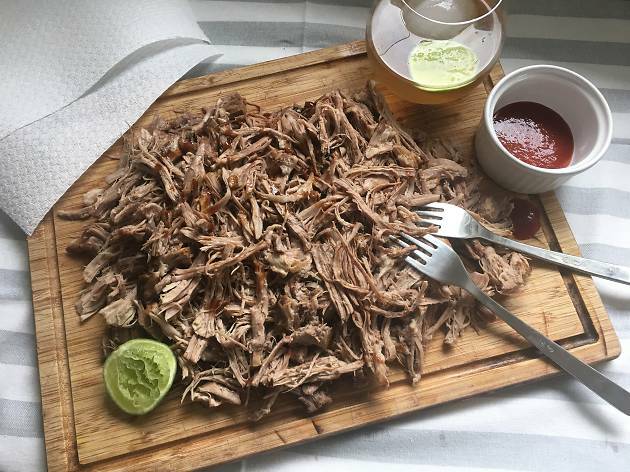 Shred the pork with two forks. 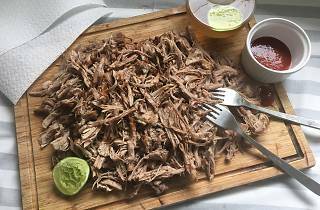 Toss pork with enough of the reduced sauce to moisten. Taste and season with additional salt, lime zest and juice and hot sauce if required. Chow Chow is as much fun to eat as it is to say - and spiking this Southern relish with booze helps bring even more frivolity to the table. You can use almost any combination of vegetables in a chow chow, but here there’s a nice balance of piquancy from the peppers, cabbage, peaches and onion. 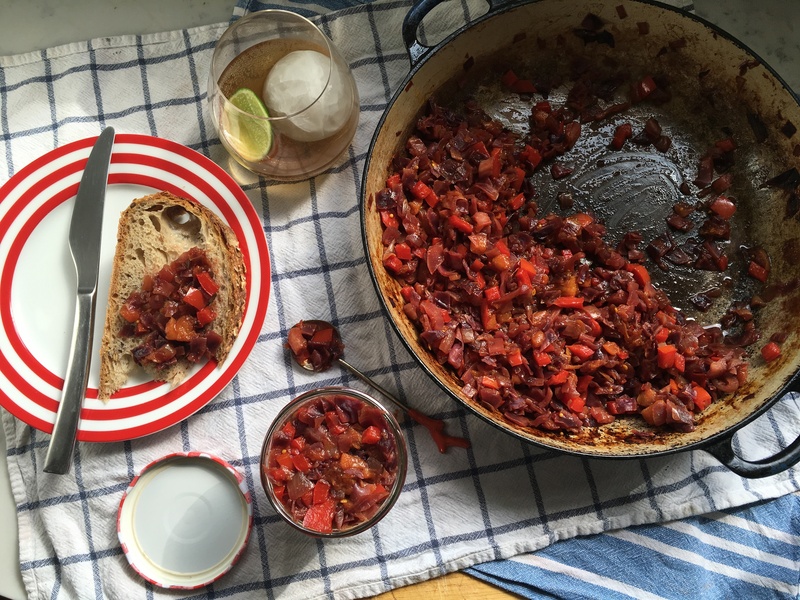 You can make this as mild or as scorching as you like, depending on the heat of your chilli and who is invited to share your table. Try serving this as a side to pulled pork or barbecued ribs, as part of a Southern ploughman’s platter, on a cheese toastie, or mix with mayonnaise for a knock-out sandwich spread. 1) In a large non-reactive saucepan, bring the vinegar, Jack Daniel’s, sugar and spices to a simmer. 2) Add the vegetables and peaches. Stir to coat and cook and stir for 10-15 minutes until the chow chow becomes tender. Taste and add more chilli, sugar or vinegar to balance the flavours to until you have a zippy relish. You can also add another shot of Jack Daniel’s for punch at this stage. Transfer to jars and refrigerate until serving. Bananas Foster is traditionally sugar glazed and booze soaked bananas, set aflame at the table. This is a slightly more genteel (and fire safe) way to consume them. Here they’re nestled in with a cuddly mass of custard sodden bread and a borderline sinful Jack Daniel’s spiked caramel. 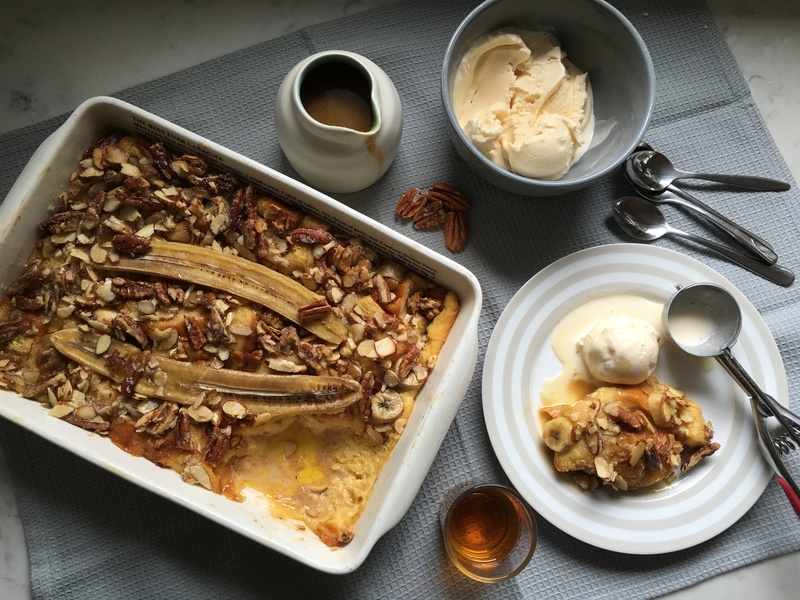 Try serving this with vanilla ice cream for dessert, or if you’re feeling like it’s going to be ‘one of those days’ – whip it out for breakfast. Preheat oven to 180 C/350 F and grease a medium baking dish with 1 tsp butter. Whisk together the wet ingredients with the brown sugar. Roughly tumble the bread and two of the sliced bananas into the greased baking dish and pour over the custard mix, pressing down to help it distribute evenly across the bread. In a small bowl add the butter and sugar and mash it into a paste. Use your fingers to combine this with the flaked nuts and scatter it and the remaining slices of banana over the bread. Bake for 35 -40 minutes, until a knife comes out clean. If at 20 minutes the top is getting too brown, cover with foil. You want a golden tan and some burnished bits, but you don’t want the nuts to scorch. To make the caramel sauce combine the cream, brown sugar, Jack Daniel’s and butter in a saucepan and simmer until you have a glossy caramel. Serve the pudding with the warm sauce drizzled over the top, with vanilla ice cream on the side. Nothing quite beats Southern hospitality, and sorry South Australia, we're not talking about you. We're talking about the big welcoming vibes of Tennessee. The kind of place where you get two fingers of whisky in your glass. The kind of place that's embodied in Jack Daniel's new American Serve, a 250ml can that favours the USA style - a big taste with less mixer and more of the good stuff.